The Downtown/Riverfront Streetcar is moving forward. 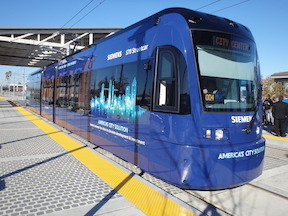 Today there was a demonstration of a Siemens S70 streetcar (made in Sacramento, but unfortunately on its way to Atlanta) at the Township 9 (Richards & 7th St) SacRT light rail station. 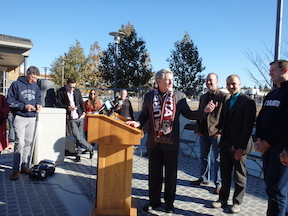 Mayor Christopher Cabaldon (West Sacramento), Councilmember Steve Cohn (Sacramento) and several others spoke about the future of the streetcar linking West Sacramento and downtown/midtown Sacramento. After the speeches, there was a ride downtown and back so people could see the streetcar in action, and informally discuss the project on the way. The sketch diagram below shows the tentative route of the streetcar, though the final route is yet to be selected and depends upon connections at the Sacramento Valley Intermodal Station and possible realignment of parts of the light rail system. On some streets the streetcar will share tracks with light rail, but light rail may be moved off K Street because a streetcar with low speed, frequent service, and closer stops fits the nature of K Street much better than does light rail. Bill Burg reminded, and Steve Hansen shared with the crowd, that it is just past the 100th anniversary of the first streetcar line on the M Street Bridge (replaced by the Tower Bridge), connecting the two sides of the river. Though the schedule seem optimistic, and the sources of the full $130M or more cost of construction are not fully identified, the streetcar could be in operation as soon as the end of 2017. 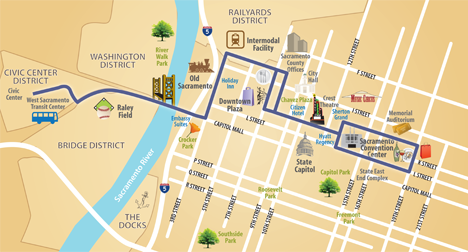 More information on the project is available on the SACOG Downtown/Riverfront Streetcar Project page, including a more detailed map, which is also here DowntownRiverfrontStreetcar_map (1.8MB). The project would complete preliminary engineering, environmental clearance, and design to develop the Downtown/Riverfront Transit Streetcar project in the Cities of Sacramento and West Sacramento. The purpose of the project is to improve transit service and local circulation, especially for shorter trips, by connecting the urban core of Sacramento and West Sacramento and supporting existing and future development on both sides of the Sacramento River. Staff recommends full funding of the request, contingent upon the participating agencies securing the estimated remaining balance of $7,300,000 for full project development costs. All policy board actions by the agencies committing current or future revenues towards the project are required before the allocation of $5,000,000 in regional funds is made. The application and supporting documentation demonstrate strong performance benefits from the project, including the reduction of VMT, expanded mobility options, and serving as a catalyst for economic development in the urban core of both Sacramento and West Sacramento. The multi-jurisdictional application is highly leveraged by local contributions, demonstrating support and cooperation among multiple agencies that will be critical for successful early implementation of the project. The project capitalizes on substantial private investment being made along the corridor, including a major infill project in West Sacramento and the Entertainment and Sports Complex (ESC) in downtown Sacramento. The new development projects underway or planned in the urban core of Sacramento and West Sacramento are projected to generate significant travel demand in the near-term that would be served by the streetcar.